I love the Royal Rumble. Outside of Wrestlemania, it’s the best event of the year, in my opinion. This year WWE has not done a very good job of hyping it up. They are marketing it as the “Biggest” Rumble ever. They are trying to sell it on the fact that it has 40 entrants. The problem is having 40 people doesn’t increase the very small number of people that can actually win the Rumble. 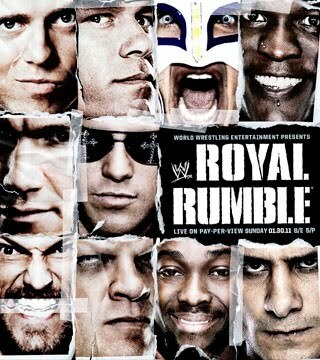 The Rumble will be won by one of these guys: Mysterio, Cena, Del Rio, Sheamus, Triple H, Morrison, Punk, or Barrett. That’s it. Just 8 men. The other 32 have no chance. If you want to throw in Big Show, McIntyre, Kofi, and Swagger, go ahead. That’s still only 12 out of 40. And those last few are a bit of a stretch. I really can’t see Swagger, Kofi, or McIntyre winning it. So let’s not bother with them. But I am on the record mentioning them so if one of them wins, I’m still right! BIG SHOW: He almost was on the previous list of guys that have a very slim shot because, well, he has a very slim shot. He has nothing going on now except that he’s big and gets thrown into random situations and knocks people out. Oh joy. REY MYSTERIO: He’s kind of a dark horse. He’s won it before and still is very popular. But we’ve seen the “biggest little man” act before and we’ve seen it result in a Rumble win. It was nice and felt special. Now, it would be the same thing again. It would be a big surprise if Rey pulled it off. JOHN CENA: Ugh. Please no. PLEASE NOOOOOO. This may be the biggest Rumble but it’s lacking star power. Who else is it going to be? The seeds are already being planted with the Miz, and he’s starting to focus on the Rumble, which means Cena is probably the favorite. I know, I know…but he is. SHEAMUS: A couple months ago I could see it. But he hasn’t been made to look strong since winning the King of The Ring. He has decisively lost to Morrison a number of times. It would make little since for him to win. He’s coming off a tag team win this past Monday night but that does little to change my mind. CM PUNK: Ok, he might do it. He’s a star and a former champion and the Rumble is one of the few things he has not won. Plus he has the Nexus in there to help him out. He has little heat with the Miz but Miz might not be champion when Wrestlemania comes around. The only other thing Punk hasn’t done besides win the Rumble, is main event Wrestlemania. After Cena, I think Punk has the best chance. WADE BARRETT: It’s not that he doesn’t have the talent, the heat, or the endorsement of McMahon He has all that stuff. He will have the Corre to help him, like Punk will have his guys. (They couldn’t come up with something better than Corre? Really?) But he’s young. He’s not as established as Punk. He’s got plenty of time to win titles and Rumbles. And he’s definitely not ready to main event Wrestlemania. I would be surprised if he wins it. ALBERTO DEL RIO: See above. He will probably be a champion before Barrett and has a better chance than Barrett because he’s been wrestling a lot longer. But he’s still not established enough. I’d give an outside shot, better than Sheamus, Show, and Mysterio, actually. But can you see him walking (or driving) out last at Wrestlemania? Me neither. TRIPLE H: OK, I’d be in favor of Triple H coming back and winning it. I’d prefer that over Cena winning it. It would a bit of a payback for HHH to come out last and eliminate Cena, since Cena did it to him a few years ago. There’s a lot against it, though. Does WWE really want to continue this trend of guys coming back from injury and winning the Rumble as a “surprise entrant”? Wouldn’t it make sense for HHH to target Sheamus when he comes back? Is HHH even going to come back and be in the Rumble? Triple H has been quoted recently talking about winding his career down and not having to be champion to still be important. And he’s going to come back after months and win the Rumble and main event Mania? I just have my doubts. If he’s in it I think he’s right with Punk as a big favorite behind Cena. But that’s a big IF and there would be lots of issues to deal with afterward. JOHN MORRISON: Another sleeper pick. I for one, would love for Morrison to win this thing. What a breath of fresh air it would be to see Morrison win it. He’s got a decent shot. I see him on the same level as Del Rio right now. Think Jeff Hardy a few years back, before he won the belt. He should get some title shots in 2011 and will probably come up short for awhile, until he finally gets the belt. He will get it at some point. I believe that. I don’t think he wins the Rumble though. Like Del Rio, I just can’t see him main eventing Wrestlemania. Not yet. But, I will go on record right now and say I think he wins the Money in the Bank this year, assuming they have it Mania. If not, then at the MITB pay per view. EDGE, ZIGGLER, MIZ, and ORTON: I would not be surprised if, say, Miz loses to Orton and then is in the Rumble and wins it. I could see any of these 4 doing that. And if that does happen, if one of the losers in the 2 championship matches somehow gets in the Rumble, that guy is my official pick. Just wanted to throw that out there. OK, I’ve analyzed it. And it’s time for a pick. With no inside info or anything, I’m going to pick CM PUNK to win the 2011 Royal Rumble. Which means Miz will lose the belt to Cena between now and Wrestlemania. And to be honest, I’m going with Punk purely because I just can’t pick Cena. I just can’t. CCW is better than WWE and TNA. Deal With It. Cena or Punk are definitely taking it. Last I heard was Christian was questionable to even make Wrestlemania, so unless the situation has changed he won't be in the Rumble. But even if he is, he'll never win it. McMahon does not view Christian as a headliner. You haven't reported this so I am not sure if you know of this, but rumor has it that Kevin Nash is booked on a flight to Boston. I think him as a surprise entrant should win…..what a pop that would get! Diesel should have won! WWE is so stupid at booking!